Imagine the sound of a gurgling stream, the splash of a fountain or the peaceful calm of a reflecting pool. Water features come in many shapes and sizes and can be a pond, stream, fountain, waterfall or simply a bowl of water on your patio filled with floating plants. Water gardening not only involves plants but can include animal life as well. Fish and frogs may inhabit your water feature while birds and other wildlife visit for a refreshing drink. Adding a water feature literally brings life into your garden. A Water Garden - The main focus of a water garden is plant life. 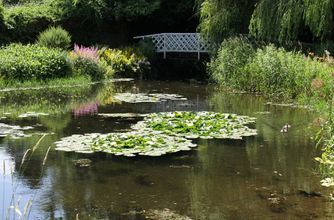 Water gardens, or ponds, enable gardeners to explore the wide world of aquatic plants, like waterlilies or lotus. Water gardens can also contain goldfish, tadpoles or snails. Gardeners may choose to add a stream, fountain or waterfall to add the sound of water to their garden. Fountains - Fountains are self-contained water features, usually made of concrete but can also be made of ceramic or metal. 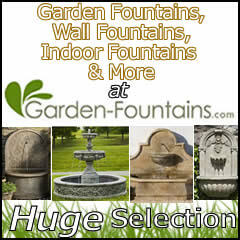 Fountains come in a variety of styles and sizes. Fountains add the sound of water to the garden without all of the maintenance involved with water gardens or ponds. 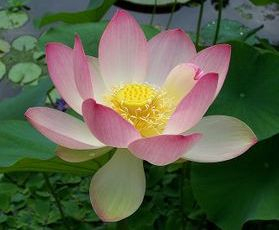 Lotus - All 3 sizes (bowl, dwarf & standard), in the pond, sitting on the edge or in a pot buried in the perennial garden. 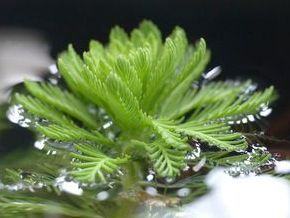 Water Snowflakes - All kinds, but particularly Nymphoides geminata. 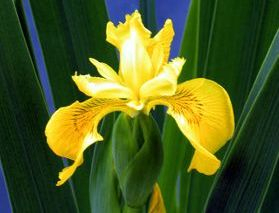 Great in containers or nitched into edges of ponds. Mosaic plant can also be used the same way. Iris - There are many kinds. Iris laevigata variegata, I. virginica 'Purple Fan' and the Louisiana Iris. Eichhornia crassipes - the water hyacinth, blooms well when confined to a container. Hardy Water Lilies - New & Old Hybrids, in the pond or in decorative containers on a sunny patio. Thalia dealbata - Also known as hardy canna, and Thalia geniculata ruminoides, 'Red-Stemmed Thalia. Both look great in containers in the garden. 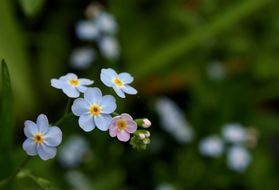 Aquatic Forget-Me-Not - Beautiful blue flowers looks great nitched into the margins or growing in a stream. Cyperus papyrus - Egyptian papyrus's feathery seed heads look great combined with the broad leaves of Red-Stemmed Thalia. Tropical Water Lilies - Day & Night bloomers which bloom in a selection of hot colors not available in hardy water lilies. Pontederia cordata - Pickeral Rush, a great native plant with purple or pink flowers. A long season bloomer it also has glossy green foliage. This is just the tip of the ice-berg. Once you begin water gardening you will get hooked, discovering new plants every year! When active growth begins in spring, fertilize your plants with fertilizer tablets...use 1 or 2 per gallon of soil. Use heavy top-soil mixed with 20-30% sand or a commercial potting mix made for aquatic plants to repot your plants when necessary. Do not use a commercial potting mix containing peat moss and perlite...these materials float in your pond. Use squat, sturdy pots for your plants. Consider plant size and shelf depth when choosing a pot. Use 1" of pea gravel to top off your potted plants to prevent soil from washing into your pond. To help keep algae under control, use a mix of floating and submerged plants. 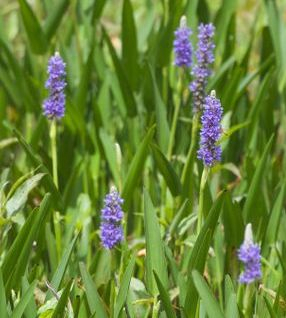 These plants compete with the algae for nutrients in your pond water. We recommend shading 2/3 of the surface of your pond with floaters or waterlilies and using one bunch of submerged plants per square foot of pond surface area. For insect problems on your aquatic plants use one of the following methods: submerge your plants totally underwater or spray insects off with a strong spray from your garden hose. Your fish will consume any insects on your plants or washed into the pond. For severe infestations simply prune away infected growth. 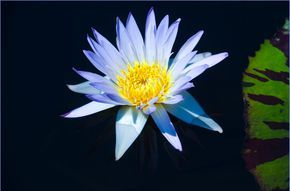 Sunlight: Waterlilies require a minimum of 5 to 6 hours of direct sunlight to produce abundant blossoms. 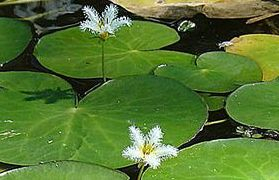 If you wish to have blooming water plants place your pond in a sunny area. Trees: Avoid tall trees that may cast too much shade and create litter that requires extra cleaning. Tree roots are also a problem when digging your pond. Utilities: Consider access to electrical and water lines. Always call your local utility companies before digging as to avoid cutting into electrical or phone lines. Consult with your local city codes department about any necessary permits for installing ponds. Buildings: Avoid areas where runoff is a problem. Also do not site your pond in areas where possible overflow would result in flooding problems. Aesthetics: Consider how the water garden will fit in with the rest of your landscape, and where you will enjoy it the most. Stone: Be sure you plan to have at least one course of rock below the water level to hide and protect the liner. Although this video recommends adding gravel to the pond, think twice before putting gravel or cobbles on the bottom of your pond. Gravel and cobbles will quickly fill up with pond muck, creating an anaerobic zone which can breed harmful bacteria and toxic gases. The gravel and cobbles will make cleaning your pond very difficult. Also, many aquatic plants can be very invasive if planted directly in the gravel bottom, plant them in pots instead. So...please keep the gravel off the bottom! Your pump should turn the water over in the pond ONCE every 2 hours (minimum). Example: 1000 gallons divided by 2 = 500. Pump gallon per hour (gph) should be at least 500 or larger. For a continuous sheet of water over the lip of the fall, you should plan on pumping 100 gallons of water for each inch of width of the lip of your fall. Example: A 6" wide water fall should have 600 gallons of water going over it for a continuous sheet of water. Next, determine the height of the waterfall and how far from the pump to the water fall. Example: If your waterfall is 4' high you will need to find a pump that at 4' of height will be pumping 600 gallons of water. For every 10 feet of horizontal run of your tubing add an additional 1' of height. Restricting the size of your tubing will slow down the flow of water. Always plan on using the biggest tubing possible for the maximum flow of water. Add twice the depth of the pond to the width and length dimension then add 1' for over-lapping the edge of the pond. Example: for a 10'W x 12'L x 2'D pond, Width 10' - add 4' (twice the depth) = 14'. Length 12' - add 4' (twice the depth) = 16'. Add 1' to each dimension for overlap at the edge. Liner is now 15' x 17'. You should purchase at least a 15' x 17' liner. Please remember that algae is a plant and is beneficial in the water garden. As with all green plants, algae uses up nutrients found in pond water and through the process of photosynthesis gives off oxygen which your fish need to survive. A balanced pond contains relatively clear water, yet allows some algae to exist for the benefit of fish and other pond inhabitants. In a balanced pond you should be able to see your hand when placed 12" under water. Do you have green water? Don't worry. 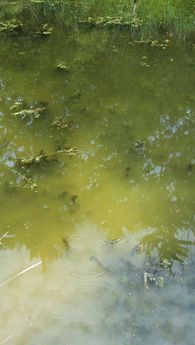 Green water normally occurs in early spring before your other water plants have begun to grow. It also will appear whenever you add a lot of fresh tap water to your pond such as after a pond cleaning. Whatever you do, DO NOT use algaecides or flush and refill your pond. If you do the green water cycle will begin all over again. What you should do is to add a pond product containing beneficial bacteria which will speed up the clearing process. Speaking of tap water, in the Kansas City area, tap water is treated with both chlorine and chloramines. Unlike chlorine, chloramines take up to 90 days to dissipate from tap water. Thus, it is essential to use a de-chlorinator whenever adding fresh tap water. Failure to do this will cause death for your fish and other pond life. Cover 50-75% of your pond surface area with pond plants. The less sunlight which reaches the water means the less algae you will have. This can be done by using water lilies and other floating plants like water hyacinths or water lettuce. Use submerged aquatic plants, about one bunch per square feet of pond surface area. These plants compete with algae for vital nutrients needed for algae growth. In addition they also provide a spawning area for fish. Fish are not only pleasant to watch but they also are beneficial for consuming insect pests like mosquito larva. 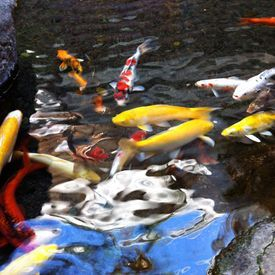 Fish should be stocked at the rate of 1" of fish for each square foot of pond surface. If you wish to have more fish please add a good filtration system which will remove excess fish food and fish waste from your pond water. We recommend only feeding your fish once a day, with just enough food for them to consume in a few minutes. Feeding too often or too much will decrease your water quality and encourage algae growth. Water hardness (KH) and water pH are also important for the health of your plants, fish and for algae control. When pH and KH are in their ideal range, everything does better except algae. In the Kansas City area carbonate hardness (KH) should be around 125-230 parts per million. Water pH should be between 6.8 and 8.3. Use a water testing kit to determine your KH and pH. Once you follow these simple steps you can sit back and enjoy your beautiful water garden! Putting your pond to bed for the winter is easy if you follow the following guidelines. CUT BACK: Just like in your perennial garden, winter hardy pond plants will need to be cut back for winter. Trim off all of the dead or dying foliage and clean up your pots. Winter hardy plants can be left at the same depth at which you had them during the summer months. Water lilies and lotus should be at about 18-24" deep. Plants which are marginally hardy in our area (such as Thalia, Parrot Feather or Floating Heart) should be placed on the floor of the pond. BRING INSIDE: Tropical plants will need to be overwintered inside. If you have the space you can set up a small indoor water garden. Some tropicals should be disposed of and replaced next year (like water hyacinths). Tropical lilies can be stored in a greenhouse or the tuber can be stored in damp sand at about 48-60 degrees F.
STOP FEEDING: Cold water fish can stay in your pond during the winter. If your pond is 24" deep your fish will survive. Fish metabolism slows down when the water gets below 50 degrees F. At this temperature they require less oxygen and little or no food. Cold water holds more oxygen than warm water so no aeration should be needed. Stop feeding your fish when the water is below 50 degrees F. Tropical fish should be brought inside and overwintered in an aquarium. 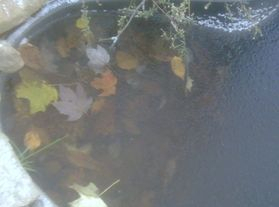 USE A DE-ICER: The most important thing to do is to remove all organic matter and dead plant material from your pond. We recommend removing your pump and replacing it with a thermostatically controlled pond de-icer. If you allow your pond to freeze over solid any decaying plant material will create poisonous gases under the ice which will kill your fish. USE NETTING: Remember to place some netting over your pond to prevent tree leaves from collecting in your pond during the winter. The netting can be "tented" over the pond and held down with rocks around the edges. TURN OFF: If you have not done so, turn off or remove your pump during the winter. Warm water settles to the bottom during the winter and that is where your fish will 'hibernate.' By running your pump you will actually recycle cold water to the bottom where your fish are. Waterfalls and other water features can also freeze solid during the winter creating 'ice dams' which can drain your pond.